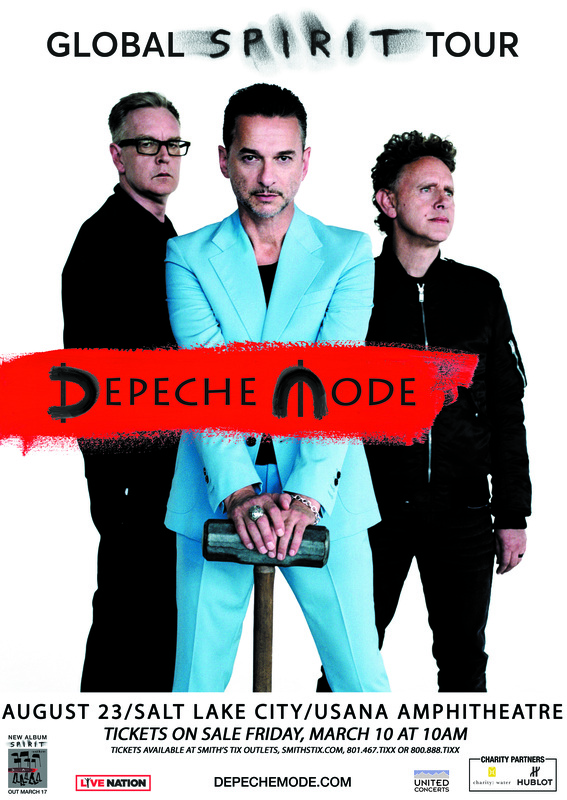 After what will be 8 years since they last played live in Salt Lake City, Depeche Mode have announced a date: August 23rd at USAna Amphitheater. Tickets are on sale this Friday March 10th. Click here to purchase tickets. Presale options from AT&T and Citi are going on starting Tuesday March 7th. I ended up getting mine today from the official Depeche Mode site presale. And decent reserved seats, too. I’m pretty excited to see them live again, which if my count is correct, will be the 10th time. That 9th time was with Dave2 and my daughter, which I blogged about here. Dave’s concert review is at this link. And now we wait till August 23rd for the live show return to Salt Lake City. Up next is March 17th with the new album “Spirit”. I’m curious about the sledgehammer in the poster and what it has to do with “Spirit.” Are they planning to crush our spirit this tour? Are the planning to honor the spirit of Peter Gabriel (although not dead) with a rousing cover of “Sledgehammer”? What’s up? Inquiring minds want to know!! I like your guesses. A cover of Peter Gabriel’s “Sledgehammer” would be most welcome. I will find out on Aug 23rd. Woohoo. I’m actually excited about the new album. Crosses fingers it’s better than Delta Machine. Yeah, album comes out tomorrow. I am really hoping for something a lot better than Delta Machine.